The WBB Business Conference was created to give local business women an avenue to invest in their business, network with other women in business and enhance their professional and personal development. Produced as an annual event by the Women’s Business Bridge, a professional women’s networking group, that is a program of the Greater Stillwater Chamber. This year, we Celebrate YOU! 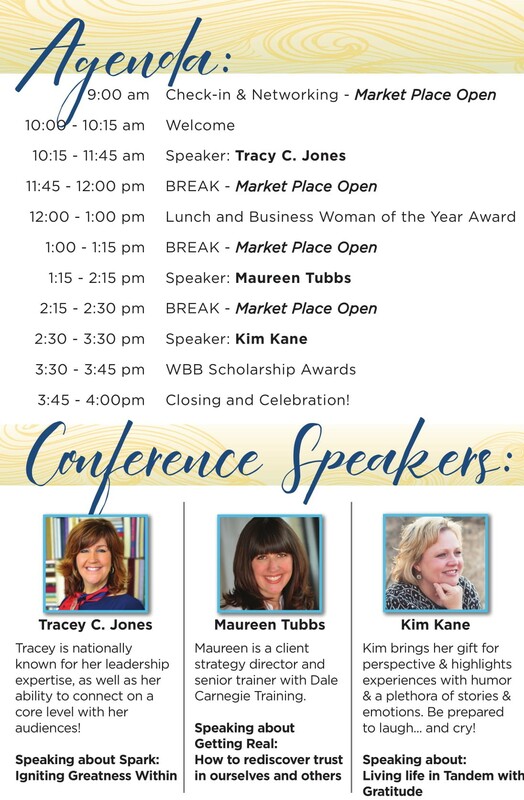 The 5th annual WBB Business Conference will bring you NEW Speakers, NEW Business inspiration & ideas, NEW connections and much more! A highlight of the day is the awarding of the Business Woman of the Year. Connect with women in business, Learn from some of the best women in business and Grow your business! >Build a community tradition that gives back and honors women in business. Support the WBB Conference with a Sponsorship – See Options HERE!